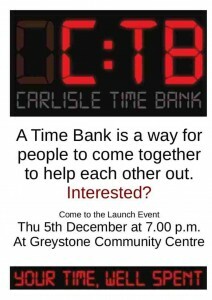 Great News, the Carlisle Time Bank is ready to be launched! The launch will take place on the 5th of December at Greystone Community Centre at 7pm. Come and find out how the Time Bank will work, register and find out what people would like to ‘trade’ in time. How can your organisation or community benefit from the Time Bank? A Time Bank is a way to bring people together so they can share skills. For every hour of time you give, you can get an hour of someone else’s time back. A core principle of time banking is that everyone’s time and talents are valued equally. It would be great to have a good turnout for the launch event and I need your help to make it a successful event so please tell your friends, family, neighbours, acquaintances, and anyone with an interest in this exciting project. Here is a poster for the event – we’d be very grateful if you could display this at work – or pass it on? We will have speakers from neighbouring Timebanks. A film on Time-banking and other forms of collaborative consumption, a discussion and free food.